Ah, it’s time for another Would You Rather? question, this time comparing two different breakfast options. Option #1: You can never eat dougnuts again. Option #2: You can never eat bagels again. I think this one is pretty straightforward, no explanation need. I’ll be curious to see the results. Please argue your various reasons/points of view in the comments. Pictures via Business Week and After Taste by Sherry. What’s up with the poll? Favorite style of pizza? I would give up bagels, no question. Maybe it’s because out here in California I’ve never had a bagel I thought was that good. I’d give up doughnuts. I’ve never been big on sweet food in the morning and if I got a craving for something sweet I could have a flavored bagel. But I love bagels. So no contest. I worked in a bagel shop making bagel sandwiches for the masses, meaning my breakfasts and sometimes lunches were bagels with all sorts of cheeses and meats in between giant wads of dough. Not that I love doughnuts, but I can’t stand the thought of eating bagels again, unless the insides are scooped out. And yes, when you ask someone to scoop out your bagel, YOU ARE A JERK. If you don’t want all the dough in a bagel, go order a freaking breakfast sandwich with bread. Otherwise, don’t be a baby and enjoy the ball of dough sitting in your stomach. I’m from Montreal, greatest bagels EVER are found here. So screw the doughnuts. this is weird. i defintely prefer bagels and voted thusly. but all this talk has got me jonesing for a donut. are we counting Bear Claws as a Donut? are we also including Donut Holes (or Munchins, if you will)? gotta love an old fashioned glaze donut. The last bagel I had was three years ago, and the last bagel before that was probably about ten years, so…I think the choice is obvious! Keep the bagels…no contest. Doughnuts do nothing for me…well not nothing but I couldn’t give up a good bakery fresh bagel. this one is seriously a Sophie’s Choice moment or me…but when it comes down to it, I gotta drop the donuts, because great as they are, they’re a treat, while bagels, clearly, are a breakfast necessity. i cant even believe people would give up the beautifully universal begal for a crappy pastry. think what you can do with a begal. you can top it with everything: cream cheese, eggs, tomato and cheese (pizza begal! ), butter, avocado, deli meat, pesto. i mean, come on people. I could easily give up both. While I like both the huge carb and empty calorie load at breakfast prevents me from allowing myself to eat either. Well, for those that grew up with shaped bread that people try to pass off as bagels, I can understand where they’re coming from. That said, if you’ve ever had a real bagel the choice is easy. Even Krispy Kreme doesn’t stand a chance against real, fresh bagels from Mr. Bagel! These voting numbers bare a suspicious resemblance to the voting patterns in Iran. I smell election tampering! I agree, Miles. Like Ahmadinejad, I heard Eick announced the winner before the polls closed. wow, I thought this would be a no-brainer, but I’m shocked by these results. Clearly I don’t like in a “real bagel” region. I mean, if you can’t eat bagels anymore, couldn’t you put the same toppings on a piece of toast and call it a day? While of course the thought of never eating a doughnut again makes me want a doughnut sooo badly, I love bagels too much to give them up. Not to mention, I don’t feel as crappy after eating a bagel as I do after eating a doughnut! this was a tough one. after much deliberation i am prepared to give up bagels. this fatty loves her donuts & sweets too much. While I like donuts, I wouldn’t really miss them much if I had to go without. But bagels? 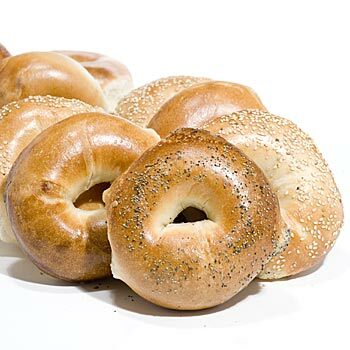 I would be miserable without them… I *love* bagels. So no question about it; I would give up the donuts without hesitation. I’m a new yorker, and yet I had to go with donuts. My insatiable sweet tooth prevails. If I want to choke on a mouthful of dense bread dough, I’ll squish my dinner roll into a ball like I did when I was in kindergarten. Bagels can be replaced. Doughnuts? Never. “Doughnut substitute” yields zero results in a Google search, but “bagel substitute?” Oh yes. About 641,000 results. I really don’t know. I think I have to go with keeping the bagels. One of my favorite breakfast foods in a toasted bagel with butter. I don’t even really get to eat doughnuts either. Have you ever tried putting toppings on a doughnut? Enough said.